Kids (and young-at-heart adults!) 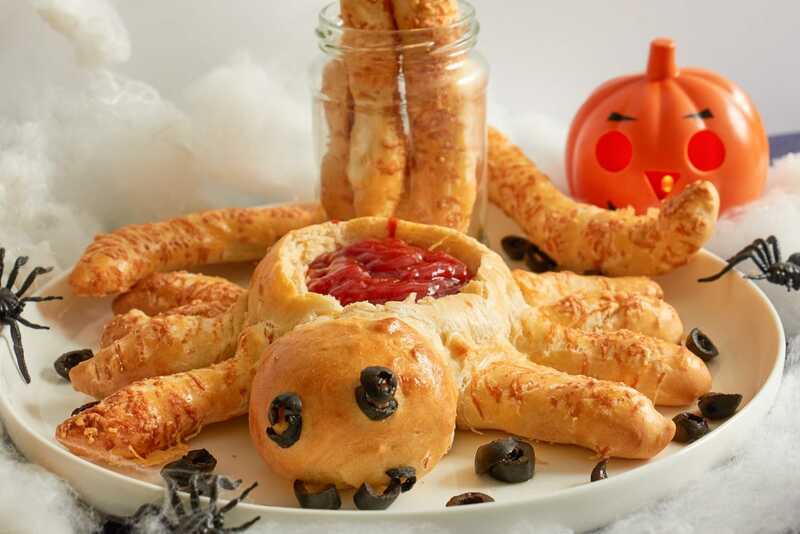 will love this spider-shaped pizza dough spider complete with marinara sauce dip in the hollowed-out body! 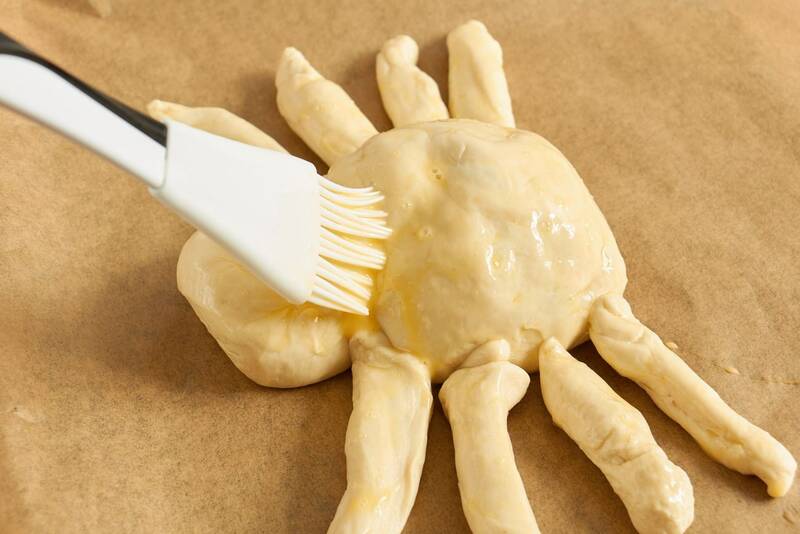 The legs of the spider and the ‘spare’ legs are sprinkled with Parmesan cheese before cooking to give the look of ‘hairy’ spider legs. Cooking couldn’t be simpler, and you can let your creative side have full rein when you’re creating the spider and its features. In fact, you’ll probably enjoy making it as much as others will enjoy eating it! Heat oven to 375°F/170 C fan/gas mark 5. Line 2 large baking sheets with parchment paper. 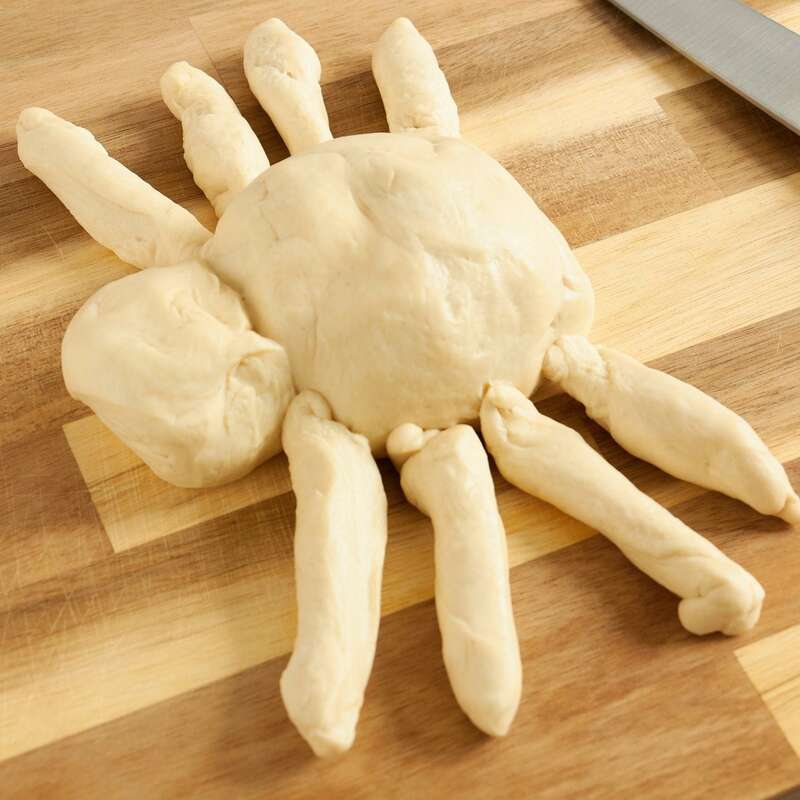 To make the spider: Cut 1 ball of dough in half. Shape one half into a 5-in. ball to make the spider body. Cut a 1 1/2-in. strip from the remaining half and shape into a 2 1/2-in. ball to make the head. 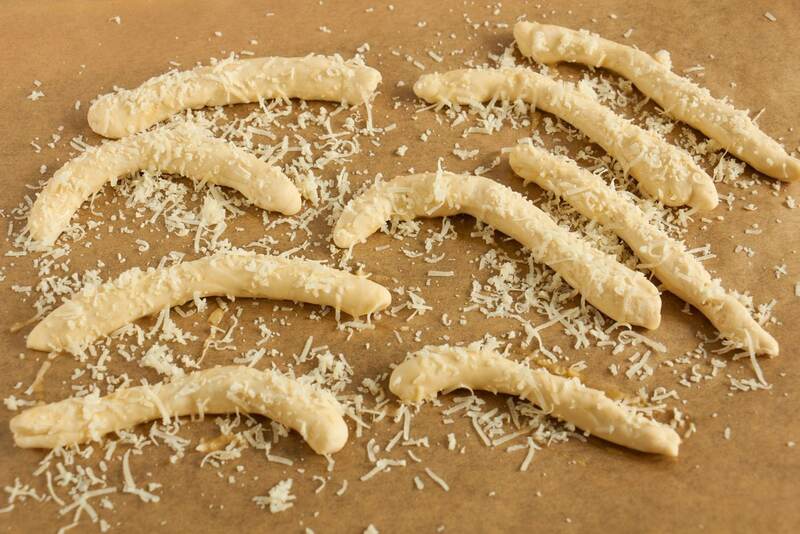 Cut the remaining dough into 8 strips and roll each strip into a 6-in. rope to make the legs. 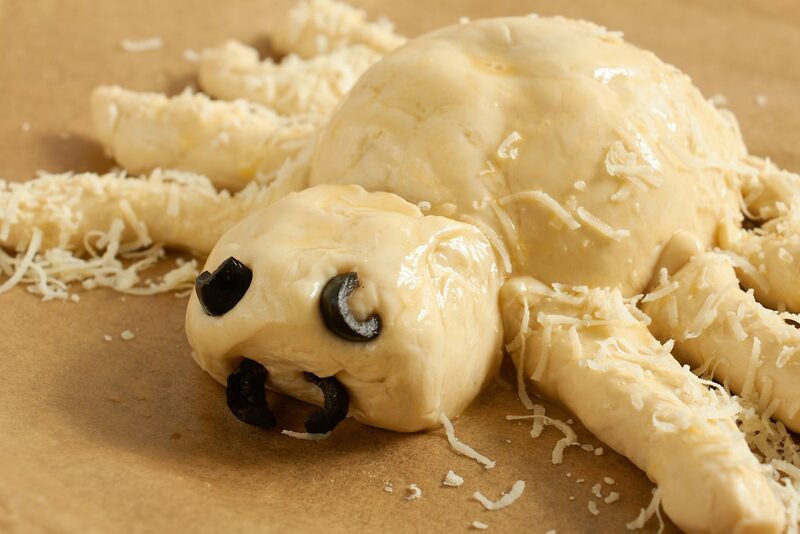 Arrange the body, legs and head on one of the prepared baking sheets to resemble a spider, gently pressing all the pieces of dough together. Brush the entire spider with some of the egg. Sprinkle the legs with 2 tbsp Parmesan. Place 2 of the olive slices on the top of the head for eyes and 2 on the bottom for pincers. Bake until golden brown, 25 to 30 minutes (covering the legs with foil if they brown too quickly before the body is ready). 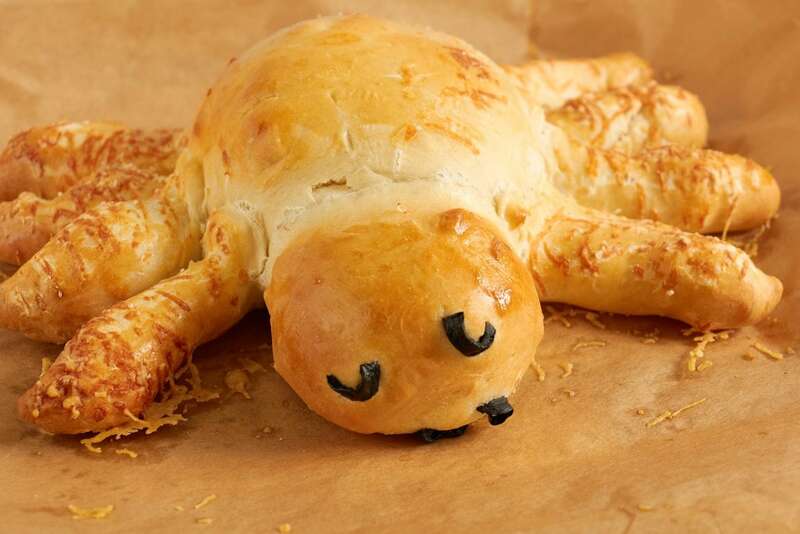 Meanwhile, make the spider leg sticks: Cut the remaining ball of dough into 8 pieces. Roll each piece into a 3/4-in.-thick rope. Cut each rope into various lengths. Taper one end of each piece and slightly bend the other to resemble legs. Place on the second baking sheet. Brush with the remaining egg and sprinkle with the remaining 1/4 cup Parmesan. Bake until golden brown, around15 to 20 minutes. Meanwhile warm the marinara sauce. 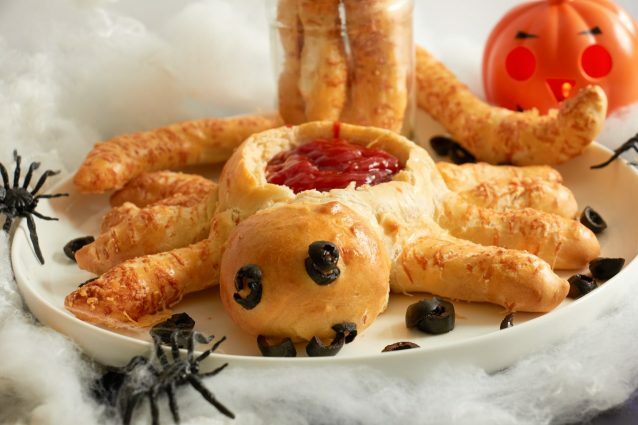 Using a knife, hollow out the body of the spider and fill with the warm sauce. Serve with the leg sticks on the side. You could garnish with poppy seeds as well for extra effect. Perfection isn’t the aim of the game here, so don’t worry if your spider isn’t picture perfect – have fun with your creation! 4 crazy cookie stamp you've never thought about! 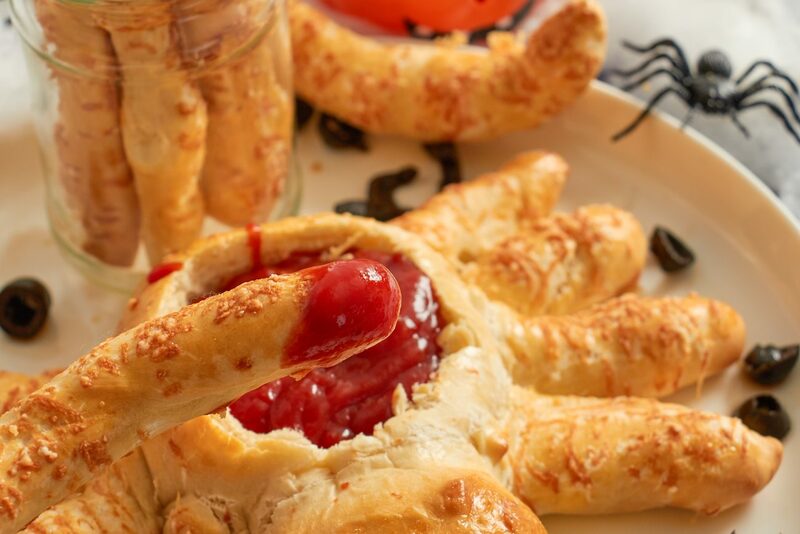 The best Halloween food ideas!